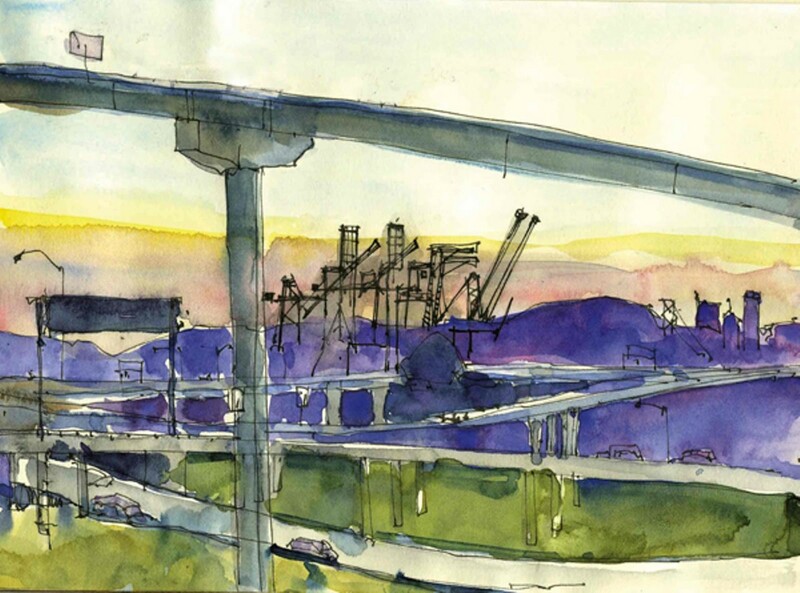 A Bay Area sketching group finds the beauty in everyday urban details. "Ikea Parking Lot View" by Cathy McAuliffe. If you've ever seen a motley crew of ten or so individuals in Pastime Ace Hardware in El Cerrito sketching a row of toilet seats — enraptured — or tracing columns of roast ducks on a corner in Oakland Chinatown, you've probably encountered the Bay Area branch of Urban Sketchers. Their subjects may skew toward the ordinary, but their goal is to capture the extraordinary therein. Urban Sketchers is an international organization started by Spanish-born illustrator and journalist Gabriel Campanario, a staff artist and blogger at The Seattle Times who in 2007 noticed a bourgeoning online community of people sharing various on-location sketches. As is so often the case, Campanario realized it was high time to start a blog. From London to Lisbon to Singapore to Seoul, sketchers from more than fifty cities in more than thirty countries began posting their renderings on the nascent Urban Sketchers site. As the community grew, people realized that others nearby shared their passion for sketching. The San Francisco Bay Area group started three years ago with that premise. 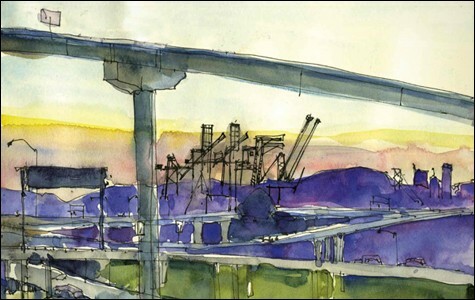 "Traditionally, artists have tried to do pretty, and that was often showing the beauty of nature," said Jana Bouc, a member of the Urban Sketchers Bay Area group. "We happen to find beauty and — mostly curiosity I guess — in urban areas." The group travels primarily between Richmond and Oakland, scouting out the most ordinary of locales. Yet the fact that its members have sketched an Ikea parking lot doesn't preclude more exotic venues: They've made field trips to the Cable Car Museum in San Francisco and even to the decidedly non-urban Point Reyes Station. The artists begin by sketching in pen and ink, either clustered together in a shop or cafe or spread out on various street corners. Then they pull out their watercolors, splashing urban landscapes with color according to their own stylistic discretion. Then they share. "Normally, in an urban setting, you walk by a fireplug and you don't notice it. You walk by all kinds of people and things, but you only see it in a sweeping, large-scale, quick glance," said Bouc. "When you start drawing it, though, you get a kind of deeper seeing."